Ham gets the royal treatment with this flavorful rub made from brown sugar, lime and spices. Preheat oven to 325Â°F. Remove ham from package. 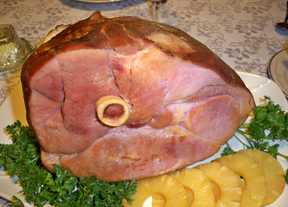 Place ham, face-down, on rack in shallow roasting pan. Using sharp knife, make 1/4-inch-deep parallel cuts in top surface of ham, about 1 inch apart. Make additional cuts at right angles to form diamond shapes. Cover with aluminum foil. Bake 1 1/2 hours. Meanwhile, combine sugar, mustard, ginger, allspice and cloves in small bowl. Add lime peel and juice; mix well. Remove ham from oven. Press sugar mixture evenly onto ham using back of spoon, covering top first, then sides. Bake, uncovered, an additional 30 minutes, basting ham with pan juices every 15 minutes. Transfer ham to cutting board. Let stand 10 minutes before carving to serve.